WHO IS AFTER ALICIA ? AND CAN HER PROTECTOR AND MATE JOSH WITHERS KEEP HER SAFE? 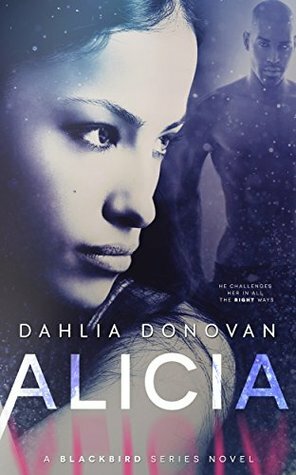 I received an ARC from the amazing an very spelling bounding author DAHLIA DONOVAN. In exchange for an honest for an opinion. This is Mismousey’s very honest opinion of her ALICIA in the BLACKBIRD SERIES. I am very honored to have been asked to read this series. I started out reading the last book in the series without knowing it. The name of the book caught my eye and so did the cover. They both called to me right away to read it. Without realizing that I had read the last novel. I next went onto Ivy which is the first. So after I give you my take of this very delicious book. Look for well hot one too!. Now let me tell you what I think of amazing author. Ms.Donovan has so much talent and imagination which shows as you read her books. She is able to capture you right off from the very first page of the story. It is truly remarkable. Her shape sifters come to life and jump off the page at you. As she takes you around the world keeping Alicia safe – you are able to visualize each scene in the smallest detail. Ms, Donovan is unique once she sets pen to paper and starts telling her story of her sifters. She has them paired and being loved as only she can do. Alicia is the story of one sifter who is of Moroccan family and of wealth. But some one is trying to get to her and to her family. Now she is in danger, Alicia was attending her best friends wedding as her maid of honor when some one had taken a shot at her. Instead of it hitting her- it killed her friend Jazz, who was in front of her. Josh swept her away , and they got the rest of the wedding party away also. No one else was hurt. Her friend Ivy contacts her and lets her know that she is fine. Alicia uncle tells her that she is being sent to her home in Morocco and her spoiled step sister will be there. She gets very upset, why does she have to put up with her. She is so winey. That is all she does, and spend money. During the time there they find out that her step sister has gotten her mother to think that she is in grave danger so now her family is trying to kidnap her. Wrong wont happen. Josh takes off with her. And her uncle punishes her sister. Now in Scotland they think they are safe- but are they?? This story has a lot of twist and turns. Ms. Donovan keeps you on the edge of your seat. Edge of the page. This is one story that you don’t want to miss !! You have to read and find out what happens. Is Josh able to protect his mate?? I recommend this book to every Paranormal Fantasy Reader . This is a MUST READ ONE THAT YOU DON’T WANT TO MISS!! Mismousey gives this book a firm rating of 60 out of 5 stars. NOW RUN SIFT AND GET YOUR COPY TODAY!!! AND MAKE SURE TO ADD THIS BOOK TO YOUR GOODREADS TO READ LIST!! AFTER YOU HAVE READ THE BOOK MAKE SURE YOU LEAVE A REVIEW FOR THE AUTHOR. REMEMBER NOW GO GET YOUR COPY NOW!! Ms. Donovan– I am certainly hoping and looking forward to a Book 6 in the BLACKBIRD SERIES! PLEASE!!! I need to find out more of what goes on next ( hint hint) And Girl you are AWESOME!!! !